Anyone that has ever grown tomatoes or peppers knows the importance of providing plenty of support for your plants. There is nothing more devastating than growing a beautiful tomato plant loaded with ripening fruit – only to watch it collapse during a mid-summer thunderstorm. Even more disheartening – some healthy plants can just simply fall over and break without warning from their own weight as they grow. You can go from thoughts of pasta sauce and salsa dancing in your head to an empty plate in a single day! Good support not only helps keep plants growing strong – but the added light and air flow prevents disease and pest problems, and allows them to ripen more evenly. 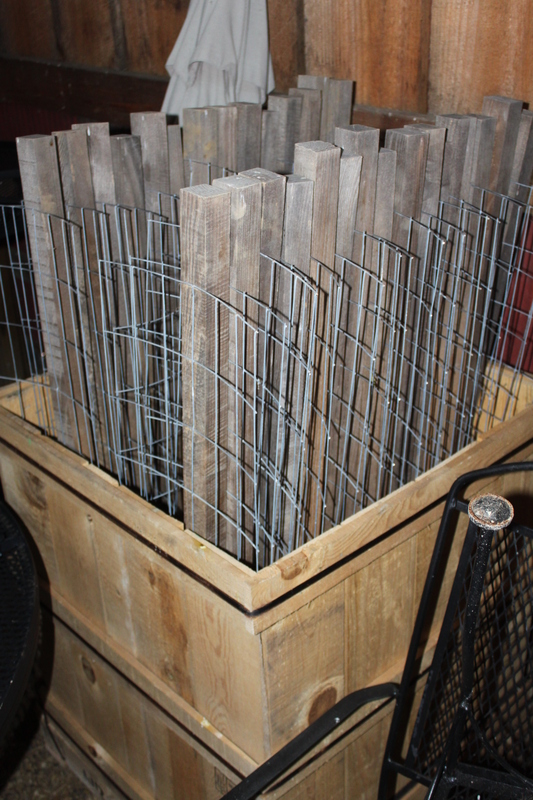 Although traditional tomato stakes and cages both work -they both have obvious disadvantages. 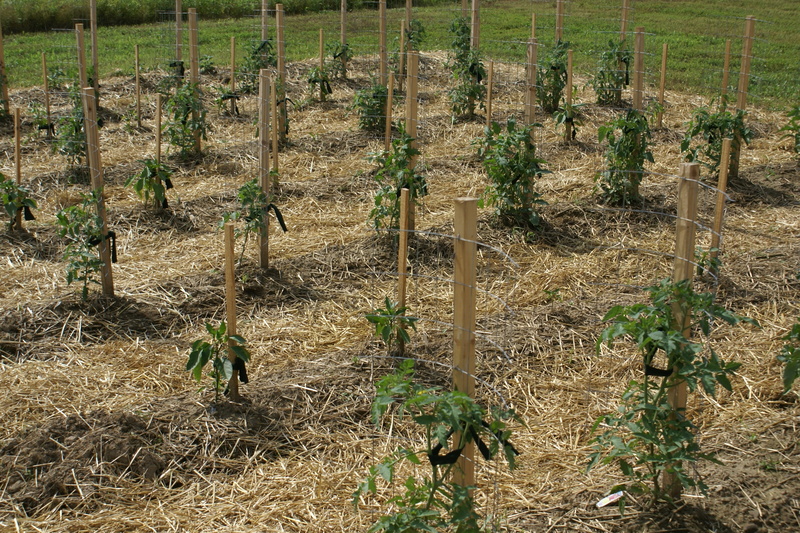 With stakes – it can be hard to tie the tomatoes up as they grow, and branches can become unsupported with just a single post to tie off your plants. Even though cages provide a better place to tie off branches from your plants – tomatoes and peppers can be hard to harvest through the circular cage. Cages also seem to have the ability to grow right out of the ground as plants mature – not to mention they can be very pricey! The answer – make your own using the best of both worlds both to create the perfect tomato and vegetable support! – Take a nice sturdy stake, attach to an open piece of wire fencing – and voila – you have your very own, home-built Stake A Cage! A few years back, we wrote our first article on our DIY Stake A Cage – and ever since, we hear from gardeners all over the world that have built their own and love them too! Wooden stakes – Stakes cut to length (we use 5′ stakes for large tomatoes, 3 to 4 foot stakes for smaller tomatoes and peppers, and 18 to 24″ stakes for small plants like banana peppers). If you buy them in the standard 8′ pieces, you can simply cut in half to make 2 from each board. You can also make your own stakes from scrap 2×4’s and 2×6’s – running them through the table saw lengthwise to make 2×2’s and then cutting them to length. To make a sharp point on the stakes – you can use a jig saw to cut angled points on the end of one side. If you angle all four sides – it makes for a sharper point to drive into the ground. Roll out the galvanized welded wire roll, and using wire cutters – snip off 18″ wide sections for tomatoes, or 12″ wide sections for peppers. Then nail in 3 fencing nails, one at the top, one in the middle, and one at the bottom to secure the wire to the stake. Now you are all ready to grow some great tomatoes this year!! !